When you need an extra commode, walker, wheelchair, or other durable medical or assistive equipment, where can you turn? Or, if you are no longer in need of this equipment, how can you get rid of it responsibly? We have the answer! There are several organizations in the Delaware Valley that take donations of your gently used equipment or unopened medical supplies. Also, there are several retail and non-profit organizations that provide refurbished equipment for much less than you would pay for at an online retailer or at your local pharmacy. Follow the links to the organizations below to find ways to Reduce, Reuse, and Recycle! Magee accepts certain items for donation to be passed along to patients in need. Magee does not accept donations unless they are approved in advance. Please email MRH_DONATEDEQUIPMENT@jefferson.edu with a description of the item(s) along with a photo (if possible). No phone calls, please. From their website: A division of Goodwill Industries of Southern NJ & Philadelphia, Goodwill Home Medical Equipment collects, sanitizes, refurbishes, and sells gently-used durable medical equipment and unopened medical supplies at affordable prices. Our centrally located 10,000 square foot facility in Ewing, NJ serves as a retail store, donation center, showroom, and refurbishing center. 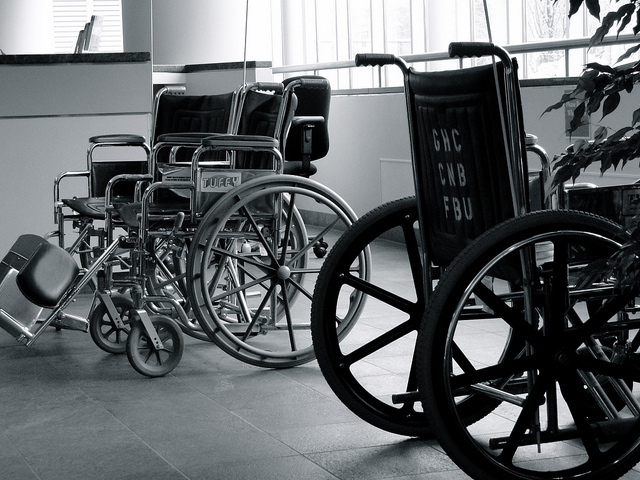 Our inventory changes daily and includes wheelchairs (both power and manual), pediatric wheelchairs, walkers, portable ramps, lift chairs, hospital beds, bariatric hospital beds, canes, crutches and bath and shower items and MUCH more. We also offer new affordable medical items including incontinence, wound care and ostomy products. All items are sold at drastically reduced costs—translating into huge savings on items that are often not fully covered by health insurance, Medicare or Medicaid. From their website: The goal of the Reused and Exchanged Equipment Partnership (REEP) Online Classifieds, hosted by the Pennsylvania’s Initiative on Assistive Technology (PIAT) at the Institute on Disabilities of Temple University, is to put Assistive Technology equipment that is not currently being used into the hands of someone who can benefit from it. This classifieds listing is one component of REEP, which also includes several centers that repair, refurbish, and then donate items to Pennsylvanians with disabilities. REEP Online Classifieds is free and available to people with disabilities, their families, friends, service providers, and others who want to find, buy, sell, or donate previously owned AT. Sellers can post listings, including photos, and buyers can review the listings and request the seller’s contact information. PIAT’s Assistive Technology Resource Center (ATRC) Information and Assistance staff can post and search the listings for those without computer access. The Reused and Exchanged Equipment Partnership (REEP) Online Classifieds is primarily for Pennsylvanians, although we do accept entries from neighboring states. The program is designed to facilitate equipment exchange between individuals and is not for the use of vendors or distributors. From their website: The medical supplies and medical equipment Project C.U.R.E. delivers to severely resource-limited communities save lives, make diagnosis and treatment possible, protect health workers and ensure better outcomes for surgery and emergency care. ProC.U.R.E. is Project C.U.R.E.’s linchpin program, through which we receive medical supplies and equipment from U.S. hospitals, medical manufacturers, wholesale distributors, and individual donors. We operate large distribution facilities across the United States where we receive, process, and ship these generous in-kind donations to hospitals, clinics, and community health centers in need around the world. Because of our large international distribution network, almost every type of medical item can be accepted, and all donations are receipted for tax purposes. The Philadelphia region’s drop-off distribution center is located in West Grove, PA.
From their website: As neuromuscular diseases progress, MDA Care Center team members are prepared to recommend and prescribe various types of medical equipment that can increase independence and quality of life. When such equipment is needed, MDA offers assistance in locating prescribed items through its national equipment program and referrals to community resources. From their website: The ALS Association Greater Philadelphia Chapter recognizes that most people with ALS will eventually need durable medical equipment (DME). Unfortunately, not all medical equipment is covered under health insurance or there may be a high out of pocket deductible for the equipment. The Magee website and blog may contain links to other websites (“Linked Sites”). The Linked Sites are not under the control of Magee, and Magee is not responsible for the contents of any Linked Site, including without limitation any link contained in a Linked Site, or any changes or updates to a Linked Site. Magee is not responsible for webcasting or any other form of transmission received from any Linked Site. Magee is providing these links to you only as a convenience, and the inclusion of any link does not imply endorsement by Magee of the site or any association with its operators.